There is no record of camels being present at the birth of Jesus. Traditionally, we see the Magi riding them, but the Bible doesn't tell us how the Magi travelled, only that they came from the east. They weren't even present at his birth, anyway. So why would I start this series with a camel? Simply this: seeing this camel inspired me to want to create a Nativity set. 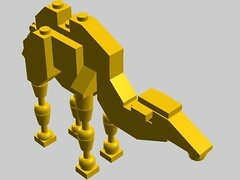 This model, "Standing Bactrian Camel", was designed by Leo Dorst around year 2000. He graciously has shared his design with the world. This LEGO Mary wears a white head scarf, as a symbol of her purity and humility. She wears long, simple gown to reflect her simple state. She kneels before the Mighty One and cradles her child, so that she can look at him and ponder God’s plan for them. 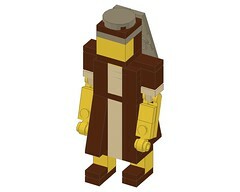 This LEGO child is wrapped up and featureless, a mystery to be revealed at the proper time. Joseph is an unsung hero. By law, he could have had Mary stoned to death. He could have disgraced her publicly and made it impossible for her to marry. He could have divorced her “quietly” to at least save his honor. He could have raised Jesus like a stepchild. He chose differently. He did what God’s messenger commanded, and more. He honored Mary’s pregnancy for the holy miracle it was, and raised Jesus like his first-born son.